It's the festive time of the year again knocking at our doors. Yay! Diwali is approaching fast !!! A festival of lights celebrated with pomp for 5 days throughout the country and abroad too where people perform pooja followed by bursting fire crackers. You can read more about the festival, spiritual significance and how it is celebrated across India over here. This is one of the most popular festivals of India, where you get to know its arrival prior to the the actual day of Diwali, due to sparkling night sky with fireworks, the smell and sound of crackers filling the air, houses getting decorated and lit up, shopping new clothes, decor items, etc. The celebration is incomplete without traditional mithais, and you find women in their house across India busy preparing great food for family. Distributing these mithais, namkeen among relatives and friends gives that additional touch to the festive mood. I remember amma would prepare a separate batch of mande/chavde, undo/laddoos, chakulis/chaklis, chivda and plates of these goodies would get exchanged when neighbours would drop in to wish us. Remembering all those goodies, I could not escape from this festival fever and sat down listing the ones to do for this Diwali. My mind was racing up and down to try and prepare everything :D. But then looking at my work schedules settled down with 2-3 items on "To do list". 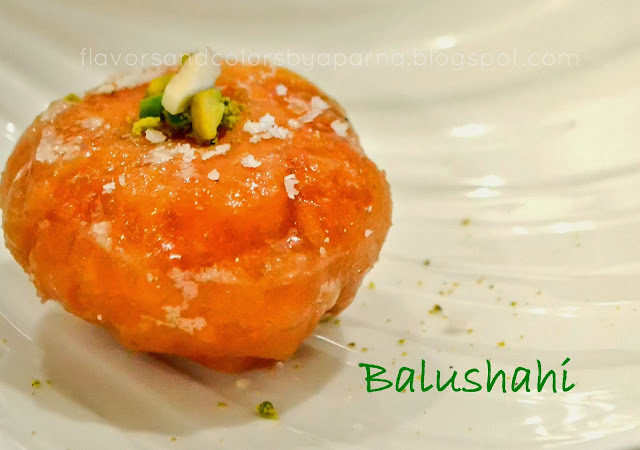 The sweet I selected to prepare was Balushahi, a traditional dessert from North Indian cuisine. It is somewhat similar to glazed doughnuts. 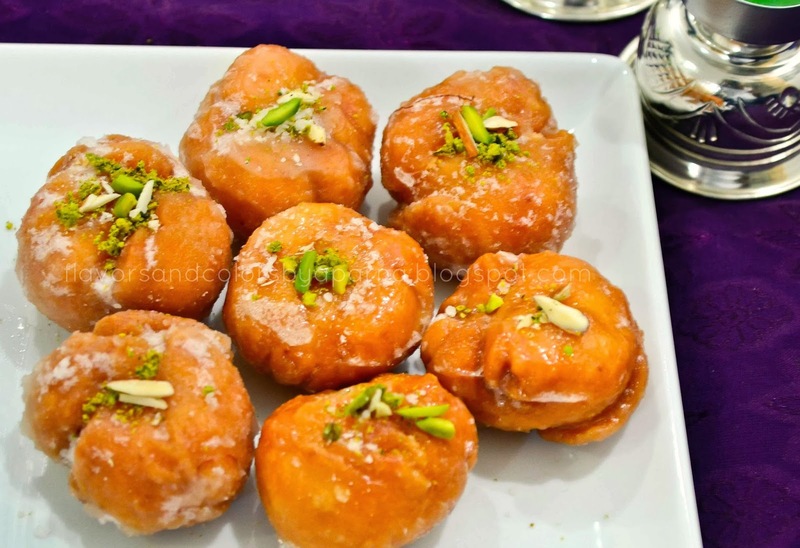 In South India, it is known as Badushah made during Diwali and other important festivals as well as during marriages. I had bookmarked the recipe that was shared by one of food group member on social website and thought it perfect to prepare for the occasion. Sieve together maida, baking powder and soda and mix it well in a wide bowl. Now add butter little by little to the dry powders. Mix it with your hands to form a crumbly mixture. Next add the curds and mix gently just to get all the ingredients together. [watch Vahchef video to see how he prepares the dough] Take care not to knead it into smooth dough. Keep it aside and cover the bowl with a moist cloth for about 30 minutes. After resting time, take dough and divide into equal portions. The round shaped balls should be the size of a golf ball. Flatten each into discs and make a depression with your thumb in the middle. [Please don't overwork with dough. The dough discs will have cracks all around and it will help the sugar syrup to seep into them as explained in the above video link] Place these discs in a dish and cover them with a moist cloth once again. Now heat oil in a flat frying pan, enough to immerse the dough discs. Once the correct temperature is reached, reduce the flame to sim. Drop the discs in oil taking care not to overcrowd them and fry them on low flame. After few minutes they will rise up, this is when you flip them to cook on other side. Fry them undisturbed till they turn golden brown on both sides. Drain them on paper towels for few minutes. Continue frying with next batch of discs until you finish all of them. Meanwhile when you are frying the last batch of dough discs, mix sugar, water, cardamom powder in a pan. Heat it till you see bubbles on the surface of the syrup. As the syrup reaches one string consistency, simmer the flame and add saffron in small quantity of water and add it to the syrup. After a minute or so switch off the flame. Dip the balushahis turning around gently into this syrup and let them stand there for 5-10 minutes. Gently remove them and place it on a serving dish. Allow the syrup to dry and then garnish with nuts of your choice. Here I have used chopped pistachios and almond flakes. ummm ... 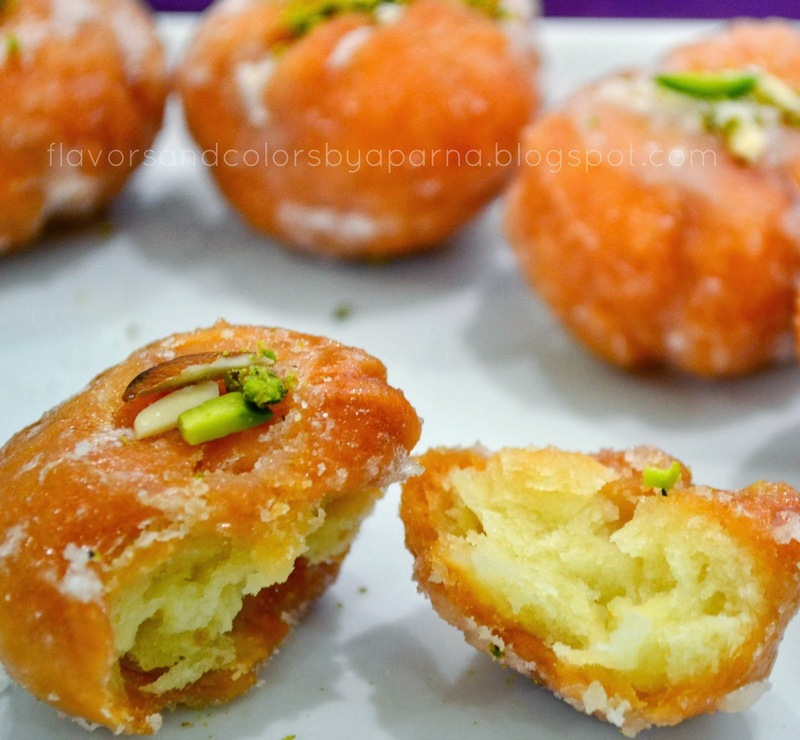 I m loving this soft sugar glazed mithai ! DELICIOUS !!! You too can enjoy them this Diwali. Try out the above recipe at home and let me know. Delicious balushahi.Thanks for linking this to Gayathri's WTML event hosted by me.Happy Diwali. Thnks Asiya,,, hope u too had a joyous Diwali !